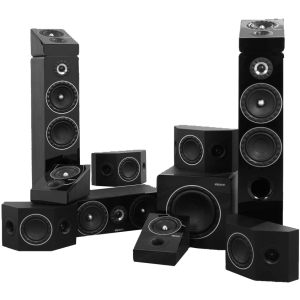 Elipson Prestige Facet speaker package consists of the ranges 14F floorstanding pair, 14C centre speaker, 7SR surround sound speakers, 6ATM Dolby Atmos speakers and SUB10 subwoofer. Elipson’s 7.2.4 speaker configuration demonstrates an excellent tonal balance of the system delivering immersive overhead effects with real precision and creating a believable sense of location. The curved cabinet edges and meticulous lacquered finish emanate class. The sculpted facet silicone rings surrounding each driver reduce baffle-borne diffractions for a smoother listening experience. This distinction lends the range its name; Prestige Facet. In 2016, Elipson revamped the original Prestige range of the 1970s, overhauling the design to include a reinforced cabinet, double-layered fronts, tweaked crossover filters, and dual binding posts. 14F 2.5-way floorstanding speakers are equipped with a 1” soft dome tweeter, 6.5” woofer and 6.5” mid/bass driver fitted with a bullet-shaped phase plug to limit vibrations. All drivers are surrounded by the multifaceted silicone rings. 14F claims an impressive low-frequency response of 38Hz. Dual silver-plated speaker terminals feature on the rear which offers the possibility of bi-wiring and bi-amping. The speaker is extremely solid, weighing a hefty 20.5kg, and sits on a removable plinth with the option of rubber feet or spikes. The 14C centre channel model mimics the 14F, with multifaceted rings and is fitted with a pair of 17cm drivers featuring bullet-shaped phase plugs. A 25mm soft dome tweeter reproduces highs with finesse and precision. The multifaceted, sculpted silicone surround rings encircling each driver reduce the baffle effect and limit diffractions. The result is an extremely precise reproduction of dialogues. The four 7SR surround speakers are designed to reproduce surround effects as part of a home cinema installation. Equipped with drivers oriented toward different points in the room, this speaker is necessary to reproduce all the atmospheric surround sound effects of films, TV series and concerts. The 7SR is designed to be wall mounted. 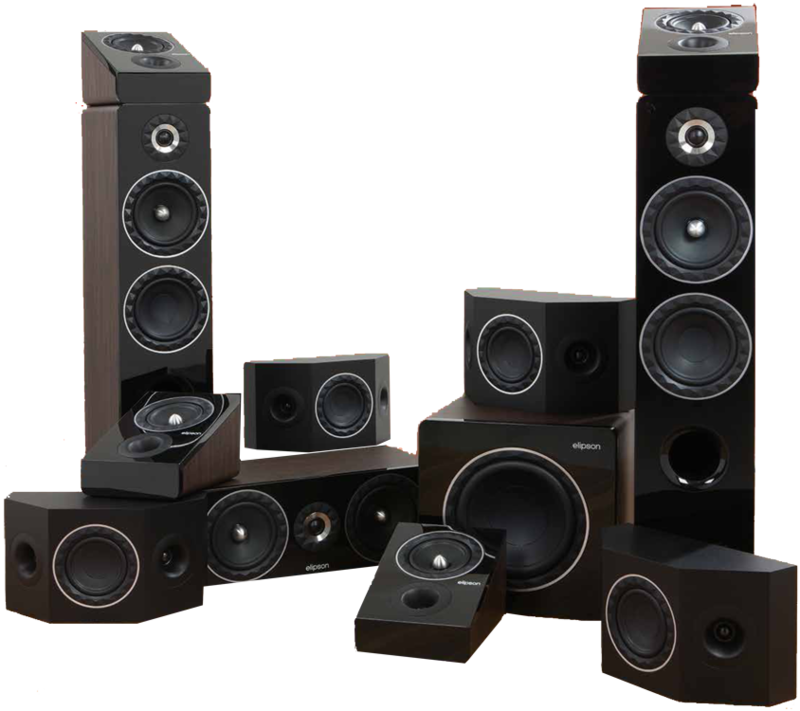 The included quartet of 6 ATM upward-firing speakers was developed in conjunction with Dolby for use with Atmos and specifically designed to be placed atop a floor standing speaker. It reproduces surround effects present in the Dolby Atmos audio tracks offered by new Blu-ray movies and adds a vertical dimension to the sound of a traditional system for more realism and greater immersion. Elipson’s SUB10 subwoofer is equipped with a 26cm driver installed in a down-facing bass reflex port configuration. It produces a considerable amount of sound pressure and offers a physical listening experience.